Perhaps the best vocalist in the history of metal, Ronnie James Dio has had an illustrious career fronting bands like Rainbow and Black Sabbath. He has also became known for his ego by, for example, changing his last name to mean 'god,' getting into a dispute with Black Sabbath for excluding 'James' from his credits or naming an album Dio's Inferno after Dante's Inferno. The man’s fantasy lyrics were partly influenced by the books of Walter Scott. Whatever the case, Dio's voice remains magical for legions of hard rock and heavy metal fans. Dio's most successful period are the classic first two albums. Dio was formed in 1983 after Ronnie and Vinny Appice left Black Sabbath. The band quickly garnered a deal with Warner and set out to record Holy Diver. The early demo recordings of Holy Diver songs featured Dio playing guitar. Jake E Lee was auditioned, but not hired. Produced by Dio himself, Holy Diver introduced the band's mascot, Murray, to the fans. ‘Murray’ had first made an appearance on the cover of Black Sabbath’s Heaven & Hell album. Perhaps unrestricted for the first time, the album unleashed a torrent of pure metal laced in Dio's fantastic imagery. The album was the scene's first real introduction to Irish guitarist Vivian Campbell whose playing was both heavy and emotional. Campbell had beat out John Sykes to acquire the position. Jimmy Bain who had played with Ronnie in Rainbow completed the band. Incidentally, it was Bain who had introduced Campbell to Dio. Dio's first show was at the Concert Barn in Antioch, California. The debut album boasted two video clips, one for the title-track and another for Rainbow In The Dark. The Last In Line was next. The album continued along the same line as Holy Diver. Sacred Heart was a bigger commercial success in the USA. Unfortunately, the song writing was generally thought to be quite not as good as the previous two albums. Dio toured the world with a massive stage show. Following the tour Campbell left the fold after growing inter-personal discontent between the guitarist and the singer/band leader. Ronnie would shrug off the departure by telling a journalist, "that's how the Irish are." Intermission was ostensibly an EP, but the album was released as a limited edition with bonus cuts which prolonged the length considerably. Dream Evil featured former Rough Cutt guitarist Craig Goldie. The man had replaced Campbell in the middle of the second tour for Sacred Heart. Following those, members and direction have kept changing with several releases faring better than others. 1992 saw a brief detour back to Black Sabbath to record the Dehumanizer album which fell apart after Tony Iommi decided to open for Ozzy Osbourne supposed final show! Halford would sing for Sabbath as openers for Ozzy. With the turn of the century, the band attempted a back-to-the-roots comeback by ditching some of the more modern influences of recent albums. Consequently, Dio began to again gain in popularity. 2003 brought the Evil Or Divine DVD. It was filmed in New York in the previous year. The summer brought a fantastic package featuring Iron Maiden, Motorhead and Dio touring across North America. Guitarist Doug Aldrich, now touring with Whitesnake was at first replaced by Ratt's Warren DeMartini and soon thereafter replaced by a returning Craig Goldie. Ironically, DeMartini's most recent experience was playing with Whitesnake. Bain quit in late 2003 and together with Vinny Appice formed a new act. Vinny had left at the end of the work for Lock Up The Wolves. He supposedly was not a fan of Goldie. Appice would later report that Bain had died on a working cruise due to cancer. Dio released its latest opus, Master Of The Moon, through Sanctuary Records on September 14th, 2004. The band soon hit the road in the USA with Anthrax and Fireball Ministry. Jeff Pilson had played on the album, but Rudy Sarzo would appear with the band live. A live CD, entitled Evil Or Divine: Live In New York City, was released on February 22nd, 2005 through Spitfire Records. It was billed as a companion CD to the DVD released more than a year previously. Dio issued a live album in 2006 and appeared in Tenacious D’s film The Pick Of Destiny. Bain and Appice reunited in 2006 in a new band called 3 Legged Dogg. Ronnie got together one more time with his former Black Sabbath colleagues and formed Heaven And Hell in late 2006. This would not mean a pause in the band Dio however. Guitarist Craig Goldy also joined Hydrogyn in 2007. A Dutch rapper called Diorno Braaf was billed as Dio for his appearance at Zomerpop festival in Netherlands on Sept 5th and 6th of 2009. The management for Ronnie James Dio protested the billing and contended that the name ‘Dio’ is a trademark of the heavy metal singer. Musical chairs! Guitarist Craig Goldy was not touring with Dio in Europe in November and December of 2009 due to his touring commitments with Budgie in Australia. Filling in for Craig Goldy would be former Dio guitarist Doug Aldrich who had busied himself with Whitesnake. Ronnie James Dio was raising money for the Brittany Foundation on November 7th at the corner of Sierra Highway and Anthony Road in Agues Dulce, California. He was raising money to “free wife/manager from her cage.” The foundation is a no-kill dog rescue charity. http://brittanyfoundation.homestead.com/aboutus.html. Ronnie James Dio was abruptly hospitalized in November of 2009 and diagnosed with “early stages” of stomach cancer. The Dio tour of Europe was cancelled. Dio was 67 years old. Moreover, Heaven & Hell and Dio drummer Vinny Appice underwent surgery on his right shoulder on Monday, November 30th following an injury that occurred during the last Heaven & Hell tour. Despite singer Ronnie James Dio being diagnosed with stomach cancer in 2009 Heaven And Hell announced three summer shows in the summer of 2010 in Italy. 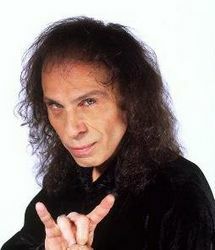 Ronnie James Dio died on Sunday the 16th of May at 7:45 a.m. PST due to stomach cancer. He was hospitalized for the last time on the 14th of May. At the time of his death he was the singer for Dio and Heaven And Hell. He was formerly with Elf, Rainbow and Black Sabbath among others. Following singer Ronnie James Dio's diagnosis of stomach cancer in November of 2009 Heaven & Hell had cancelled all its summer shows including an appearance at 2010's Bloodstock. His death was first rumoured the night before and subsequently denied by his wife and manager Wendy Dio. Ronnie James Dio was 67. There was a public memorial service for Dio on Sunday, May 30th at 2:00 p.m. at The Hall Of Liberty at Forest Lawn Hollywood Hills, 6300 Forest Lawn Drive in Los Angeles. Wendy Dio, the former wife and manager for Ronnie James Dio, criticized several upcoming tributes to Dio. She was a board member of the Ronnie James Dio Stand Up And Shout Cancer Fund. The surviving Heaven & Hell members Tony Iommi, Geezer Butler and Vinny Appice would play a tribute show at that year's High Voltage festival on July 24th at Victoria Park in London, England. The musicians would be fronted by former Deep Purple and Black Sabbath singer Glenn Hughes and Masterplan's Jorn Lande. The latter band was about to release a tribute to Dio. The Rods and ex-Elf guitarist David "Rock" Feinstein, who was a cousin of Ronnie James Dio, announced he was cancelling his participation in Magic Circle Music's tribute album. Dio At Donington UK: Live 1983 & 1987 was a new Dio release, which was due on November 9th, 2010. It was a two-CD package with photos from both concerts. Ronnie James Dio would also have a statue dedicated to him in the Bulgarian town of Kavarna. The statue would be placed in the city's central park, as part of a ‘Walk Of Rock’ project. A Dio compilation, entitled Mightier Than The Sword: The Ronnie James Dio Story, was released in time to cash in on the man’s death in the U.K. It was issued on June 6th, 2011 through Sanctuary. The two-disc collection featured tracks from Elf, Rainbow, Black Sabbath, Dio and Heaven & Hell. Several ex-members were also at it travelling as Dio Disciples and had even recruited former Judas Priest singer Ripper Owens and even Doro Pesch. Also in were former members Craig Goldy (guitar), Rudy Sarzo (bass), Simon Wright (drums), and Scott Warren (keyboards). Goldy was also in another cover band, namely Purple Rainbow. Another tribute and a book were also in the works. Vivian Campbell, guitarist for Dio in the early days and currently with Thin Lizzy and Def Leppard, has gotten together with former Dio members Jimmy Bain, Vinny Appice and Claude Schnell to rehearse and play material from the first two Dio albums. The news was peculiar given Dio’s disdain for Campbell and the Irish guitarist’s disdain for Ronnie James Dio and the music he occasionally denigrated. Wendy Dio, the widow of Ronnie James Dio, married her boyfriend of many years, Omar Gimenez on September 9th, 2012. More offshoots followed. Playing songs from the Dio records that they appeared on Last In Line were guitarist Vivian Campbell, drummer Vinny Appice, bassist Jimmy Bain and keyboardist Claude Schnell, alongside singer Andrew Freeman of Hurricane and Lynch Mob. Shows were planned. Scorpions recorded Rainbow's Temple Of The King to be included on a 2014 Ronnie James Dio tribute album. Metallica and Motorhead were also on the album. The This Is Your Life album was out through Rhino in April, 2014. Eagle Rock announced May 12th as the release date for DIO's Live In London: Hammersmith Apollo on DVD, Blu-ray and CD. The material stemmed from 1993. Last In Line - featuring Def Leppard guitarist Vivian Campbell and other former Dio members Jimmy Bain, Vinny Appice and Claude Schnell, plus singer Andrew Freeman of Lynch Mob - signed a deal with Frontiers Music. The group's debut album was due in the spring of 2015. The Ronnie James Dio Stand Up And Shout Cancer Fund, founded in memory of the singer, was putting together a series of events in Los Angeles to commemorate the fifth anniversary of the man’s death from gastric cancer on May 16, 2010. The event would include a public memorial. The Ronnie James Dio Stand Up And Shout Cancer Fund, the charity founded in memory of the dead singer by his ex-wife, was one of the chosen charities at the Monsters Of Rock Caribbean cruise on the MSC Divina in the winter of 2015. Jack Black also mentioned the charity on US TV talk show Ellen. Black mentioned the charity in connection to his band, Tenacious D, winning a Grammy for a song written for the charity. On May 17th of 2015 seven AT-6 Texans of the Condor Squadron flew above Los Encinos State Historic Park in Encino, California in honour of Ronnie James Dio on the fifth anniversary of his death. Jimmy Bain died on January 24th 2016, while on a show cruise according to Appice. Most recently he was in Last In Line with his former Dio band-mate Vivian Campbell who was also in Def Leppard. Last In Line played in Miami, Florida on January 20th 2016. Following an appearance as a hologram at Wacken Open Air festival in Germany in 2016 through Eyellusion, a corporation lined up by Ronnie James Dio’s former wife, the dead singer’s hologram would next tour around the world. Julien's Auctions would hold an auction mid-September 2018 to sell off merchandise and belongings from Ronnie James Dio. They called it “pay tribute” to the dead singer. Items being auctioned included paintings, cover artwork and used clothing. Ronnie James Dio is arguably the undisputed master of heavy metal. As a man whose accomplishments and talents reach beyond the scope or capabilities of one write-up it is obvious that anything he works on and touches is judged with a measure of wonder. In a special live double-CD culled from a 1995 show in London Ronnie and his cohorts perform the seminal Holy Diver album live in its entirety, while filling a second CD with classics of Rainbow and Black Sabbath, which Dio once fronted. Now a fair reviewer has to show some scepticism towards a band that covers its older albums. Of course, Deep Purple has done it live. Iron Maiden organized a tour around it and bands like Black Sabbath and Kiss make a living in the same manner. Issuing a CD based on one older album is perhaps taking matters a little too far. A legend like Dio probably would not appreciate being labelled a cover band of himself. Nevertheless, Holy Diver was mind-blowing and the band’s rendition is both heavy and entertaining. The singer’s voice has lost some of its range in the intervening years and sounds too deep here. Furthermore, that certainly is not Vivian Campbell soloing on Rainbow In The Dark, but in absolute terms, the first disc has more marvellous material (live or not) than many other bands’ entire careers. Compact disc number two is slightly more interesting. Featuring songs from the Rainbow days (Tarot Woman, Gates of Babylon, etc. ), Black Sabbath (Heaven & Hell and Sign Of The Southern Cross) and Dio’s own songs the assembled tunes not only serve as a reminder o the man’s heritage, but also fill a void opened by the absence of Rainbow. Where else would one hear these songs any more? Tarot Woman and Gates Of Babylon are near-perfect hard rock songs, although the playing of Ritchie Blackmore is sorely missing. Guitarist Aldrich is hardly spectacular. Moreover, the guitars are too low in the mix. The keyboards are also off somehow, especially on the latter song, but beggars can’t be choosers as the saying goes. Dio himself is a tad too dry sounding, albeit still an awe-inspiring vocalist of course.